Our nephew Glenn spent a night with us on his way home so that was a special event. He was in a mood for ravioli and we hadn’t made any in quite a while so we feasted on another of Nancy’s miracle dinners. It’s easier to pull off than you might think since we have loads of sauce in the freezer and it just doesn’t take too long to whip up a batch of pasta. Usually when we make ravioli, it’s for a crowd and that becomes time consuming but with just three of us, a single batch was all it took and we could sit at the bar and chat as we were constructing them. That was followed by another great Sunday – a UCF basketball game that went into overtime, some premium IT time where my iPhoto and iTune files were transferred from the laptop to the mini, and dinner with Tom and Tina at Mi Mexico, our favorite Mexican restaurant. Got up Monday morning and finished off prepping for the corn, planted a couple rows of the last lettuce seeds for the season and picked a few pounds of green tomatoes for Nancy’s green tomato cake. That pretty much takes care of last season’s tomato plants – all are doing their thing in the compost pile. As is the first planting of sugar snap peas that have been played out for a couple of weeks and just taking up space on the trellis. I’m going to plant a couple of cucumber seeds there this week and hope for a warm enough spring to bring them on earlier than usual. My next target area for early spring planting is a short row that has two Kohlrabi plants remaining, both pickable. I designated that for three or four cherry tomato plants and those are ready to go so before the end of Feb I’ll have them in their new home. It’s early but the 10 day forecast has nighttime temps in the 50’s and above so that should be fine – all of the plants have been fairly well hardened. Also transplanted my first tomato plant, a cherry, for the season (after picking one of the Kohlrabi’s mentioned above). I gave this guy the full, ultimate treatment which included: digging an 18” diameter hole, 18” deep; lining the bottom with dried, dead grass a few inches thick; almost filling it with new compost; then chopping in my special fertilizer mix; and finally moving the plant from the yogurt container to the newly prepared spot. My special mix includes some regular 8x2x8 commercial fertilizer, crushed egg shells, bone meal, sugar, epson salts, and this year, a book of match heads. I don’t anticipate any damaging cold this season but I have a wall of water standing by just in case. I’ll give this one plant a week to make sure it survives before planting three more in the same row. The celery I planted last week is looking good, 100% transplanting success. I learned something about growing celery that I never thought about. In the past what I’ve done is let the plants mature then harvest the whole thing. I guess that’s because it’s how we’re used to getting it from the grocery store. But the recommended approach is to cut off the outer stalks as needed and let the plant continue putting out new stalks. I do that with kale, collards, spinach, chard and lettuce but for some reason it never occurred to me to do the same with celery. If that works, instead of planting so many individual plants, I can get all the celery we need from a smaller chunk of real estate. Well our whole internet thing seems to have settled down. We just have to turn off the hotspot when not using. Well, we finally got a freeze Friday morning, the first since last January, 2014. The thermometer on the front porch read 33 but there was a thin sheet of ice on a container out in the open. The nursery pumps were running which is another indicator that temps actually fell below 32. So, did the garden make it? I suited up in “all Utah” gear. That means Polartec socks, flannel lined jeans over top of sweat pants, a flannel shirt layered with a fleece sweat shirt layered with a down filled vest; Gloves and hat. I checked it about 8AM and the tomato plants which I hadn’t covered were history. I didn’t cover them because they were done producing and I just hadn’t got around to pulling them. I had some tiny lettuce seedlings that I did cover and a quick peak under the cover showed them to be looking fine. Ditto lettuce and radish seedlings. In a few areas the cover had blown off exposing the plants, all winter plants – cabbage, broccoli, cauliflower, kale and the like. They looked fine but I won’t know for sure for a couple of days. I purposely left the Chinese greens uncovered since they were advertised to handle freezing temps. They look perfect. My plan is to leave well enough alone and keep the covers on another night even though the weather folks say it’s warming up. In fact the 7 day forecast has us back in the 80’s in a few days but I’m still keeping my eye on the Siberians and the Vortexes for a sneak attack. Post freeze analyze: It did indeed freeze as evidenced by the few tomato plants I had left being decimated. But after taking off the covers, turns out everything else is just fine, even the smallest seedlings. The forecast for the next 7 days is warm and sunny which about brings us into March with a much lower probability of another freeze. I have quite a bit growing in planters that could be moved into the garden as soon as I’m 100% convinced the weather has turned. Saw something on the tube, during the never ending weather reports, that surprised me and changed my plans for the garden this season. They showed farmers in central Florida preparing their corn fields for the pending cold spell. Not sure what they were doing but the corn plants looked to be 3-4’ tall, meaning 6-8 weeks along; meaning they were planted right after the first of the year. Granted it’s a few degrees warmer where they are but I don’t normally plant corn until early April and historically I haven’t done very well in the corn growing department. So I’m heading out to the garden and preparing two wide rows for corn and will have the seed in the ground before the end of Feb. I have a new hero. There was an article on TV about a baseball guy, a pitcher for the Toronto Bluejays named Dino something or other. He’s worth millions but choses to live in a camper. Not just any camper but a 1978 VS Westphalia exactly the same as the van we had for years. Same color, same interior configuration, same everything. He also had a kayak on the roof. Not the same as mine but I can live with that slight deviation. I asked Nancy what two people she knew who could just live like that and, without hesitation, she said me and Simon. We had a fun Sunday. Tom and I went to a UCF basketball game and watched them eek out a win with a basket at the buzzer. Before and after the game he brought my new computer up to date and showed me some new tricks that aren’t possible on the old machine. I’m still partial to the old system but am starting to see some daylight. The machine itself is certainly faster. Nancy spent the day shopping with a friend and Tina was working at the olive oil store so we all hooked at 5PM for a dinner. We did the happy hour at Bonefish and really enjoyed ourselves. We did that same happy hour a a few years ago but for whatever reason, never repeated it. What I like about it is that along with reduced price drinks, it’s a mostly seafood based finger food menu so you don’t have to get a full meal. I order appetizers instead of a main course more often than not now so this fits my style perfectly with no hassle from Nancy or Tom. I think the plan is to repeat this next Sunday for UCF’s last game of the season. Which is worse: A polar Vortex, a Siberian Express, or global warming. I’m doing a much better job raising tomato seedlings this year than ever before. I’m being nearly OCD in terms of checking them for dryness and moving them outside for sunlight during the day and inside for warmth at night. What I need to design is a conveyor belt so they automatically come in at night and go out in the morning. I’m also moving them from starter beds to individual containers (yogurt) so the roots have more room to spread. I think all this attention is working. The plants are strong looking with nice foliage and thick stalks. My problem is usually spindly stalks and wispy foliage which comes mostly from improper lighting. I also started these seeds a few weeks earlier than I usually do so when I do actually move them to the garden proper in a couple of weeks, they will be stronger. That transition is when I normally encounter fatalities and I’m thinking this year will be different. I’m also doing a better job this year of keeping a steady stream of radishes and lettuce flowing – not perfect but much better. I’m going to try a final planting in early March with varieties touted as heat tolerant. Who knows, maybe we can have fresh salad on into May. I’m also going to try to do New Zealand Spinach, aka tetragonia, this summer. I had poor luck last year but really didn’t give it any attention or deluxe garden real estate. I gave a few plants to Joey and his did excellent all summer long so it was clearly the gardener and not the seeds. I soaked a dozen or so seeds overnight yesterday and will plant them into indoor starter beds this week. They’re slow starters so it could be April before they actually hit the big time (the garden) and June before any harvesting begins. Joey had greens all summer long and just recently closed them out. The catalog describes them as perennials which means year round here. Looks like winter is finally arriving with forecasts of freezing temps this coming weekend. Since all the sensitive plants in the garden have played out, I’ll have very little to cover especially since currently the forecast is just at the freezing point and not a hard freeze. I’m actually ok with it coming now because I was starting to be concerned that a total lack of cold weather would give the bugs a head start for the spring season. A few hours of 32 degrees should do the trick. As it stands now, we are picking heavily with much of the proceeds going to friends and neighbors. I’ve done the best job ever of staggering the most popular items – lettuce, radishes, and other salad goodies – so there’s been a continuous supply for a couple of months and it looks good, right now, for it to continue on into April. In fact I just put in another patch of radishes and carrots and the last of the cabbage and lettuce seedlings. This has been an extremely stressful week relative to computer issues – particularly internet related problems. With several years of background on limited data quantity plans – first Virgin Mobile, then T-Mobile, and now ATT – Nancy and I have consistently used an average of 30 mbytes of data daily. Sometimes it could be a bit more, sometimes a bit less but that’s where it rides. Our Virgin Mobile plan was 1 GB per month and we never exceeded that; our T-mobile plan was 1.75GB per month and we never exceeded that; our ATT account is 1.5GB per month so that should be fine with respect to our use pattern. And sure enough in December we used 1.2 GB. Ditto January. So I was very happy with the ATT Hotspot – much, much faster than either system I had used before. It’s called a Gophone and is a battery powered wifi router that connects with the ATT cellular system. Then we added a second computer to the user mix. Within a few days, we were sucking up data at a clip that would last only a few days. Since the only thing new in the loop was the new computer I quickly determined that every time it was online, it was updating software with no request from me to do so. I knew the software needed updating but assumed that I could control when it happened and planned to take the new computer to Tom’s to take advantage of his unlimited data plan to bring everything up to speed. The ATT plan includes a facility to add a packet of data, 500 mbytes for $10, so I bought that and, at the same time, pulled the plug on the new computer. Pulling the plug meant taking it offline by shutting off the computer’s wifi function and going back to using the old laptop for any online activities. That went fine for a couple of days. I have always checked usage daily and saw that we went back to the 30MB average as expected. Then Nancy said she was knocked offline with an ATT message saying she was out of data. Sure enough the newly added 500MB had been sucked up into the ether. Maybe I need to actually power down the new computer – just disconnecting it from the internet wasn’t enough and it had found a sneak way to update software. I added another $10, 500MB and literally turned the new machine off. Nancy went back to her browsing on the laptop. A few hours later I decided to check the status of the data, fully expecting to find just under 500MB remaining. Nope, it was down to 200MB. I called ATT again (I did that after the first surprise) and explained that something was using all my data. The tech support person said that for sure, I should power down the Hotspot. The first tech support person said the same thing but not emphatically and said that it was possible our smart phone was connecting to the router without us knowing it. That made sense because Tom’s cell had indeed automatically connected the last time he was up but since we don’t have a smart phone, pretty sure that wasn’t a problem. But the second tech support person was much more emphatic that we should turn the hotspot off when not using it. I tried to pry out of him why that should make any difference at all but he was fuzzy on that. He also said that if you left them powered up continuously, there was a fire danger – batteries could blow up if fully charged and still plugged into the charger. The first tech support person said the same thing but that just didn’t make sense to me – why would you sell something that had a built in fire hazard? Anyway, they made good and reloaded me with another 500 MB plus a $10 credit to the account and I turn off the hotspot when we’re not specifically using it. Nancy was viewing a quilting tutorial online and the computer shut down. I think it was a social statement but she was pretty sure I was sabotaging her viewing. Possibly it was a technical problem with the computer which I think is about 5 years old or maybe older. We turned the computer back on and went directly to the tutorial. It lasted perhaps 5 more minutes before it quit again. I was suspicious of a heating problem so let it cool down for about a half hour before restarting. That was two days ago and it’s never again shut down and we’ve never again tried to run that tutorial video. What I’m suspicious of is that the video chip on the computer is overheating. The new fast internet allows videos to be viewed at all and in the past, video chips have been notorious for heating. Long story short, we ordered a new Mac Mini and will keep the laptop as a travel machine/backup. Maybe I’ll check into getting it repaired but not until the shutting down becomes a persistent problem or it dies altogether. The IT Dept (Tom) will come up when it’s delivered and oversee (do) the installation. I’m sure I could stumble my way through it but it certainly goes smoother with him in the loop. As a point of reference, I would rather visit the urologist than get a new computer. Almond milk vs cashew milk. For a couple of years I’ve been using almond milk in my morning cereal. I don’t have any particular problem with dairy but so many people I know do that I just figure it’s an ok thing to limit. My taste buds have long since died off so I don’t taste much (if any) difference. Today when making my noon time green smoothie I noticed that my bride had switched out the almond milk for cashew milk. I looked at the ingredient label and really didn’t spot any differences so I took the plunge. Just as I suspected, couldn’t tell the difference. I can see where it would be a little off-putting because it has a brownish color as compared to white. I’m getting a few laughs at watching this measles epidemic spread while the country is aghast at people avoiding vaccinations. To me this is a perfect example of how scientists have become discredited. For those who can remember, not too many years ago, there was much “scientific” discourse about a link between vaccinations and autism. Lots of data, lots of coverage – enough so that legislative remedies were put in place to cover people who didn’t want their kids vaccinated. Remember when eggs were bad for you – now considered a “perfect” food. Ditto alcohol, ditto coffee, ditto all manner of foods. Supplemental vitamins have gone from necessary to sustain life to now a complete waste of money. And with all of these came loads of scientific data. Remember when we were entering a new Ice Age – now global warming. Remember the forecast famines because there was not enough arable land to feed the projected population growth. Those places most in danger are now exporting food. Bears and Gators, endangered species with only a few hundred left in the wilderness, now being hunted to try to control the population. About a new hunting season for bears – how is that supposed to work? The problem bears are those that have moved into populated areas. Are we going to have a hunting season in the burbs? Don’t think so. The bears that live in the woods are not the problem but those are the ones that will be hunted. This year is like a continuous mild winter. No frost or freezing temps but continually on the “cool/cold” side. That means night temps in the lower 40’s and day temps in the upper 60’s. That’s just not warm enough for me but I haven’t had to seriously cover the garden – just spot covering tomatoes a few times to be safe. One crop that is outperforming anything I’ve ever experienced is the lettuce. I grow several varieties and each and every one is incredibly lush. The photo doesn’t do it justice. For perspective, the concrete cylinders you see in front of the lettuce are 18” long and the taller green plants on the left are Swiss Chards with 2’ leaves. 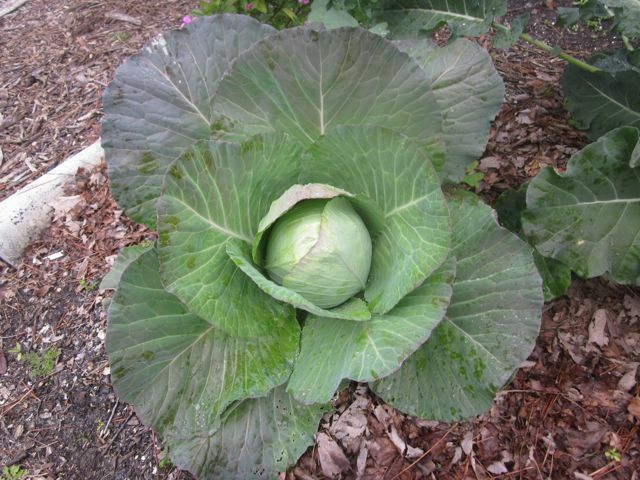 The other pic is the first pickable cabbage. In a normal season you’d see some insect damage on the outer leaves but this year, none at all. Nancy picked up the makings for corned beef so I see a traditional Irish St. Patrick’s day coming. I mentioned in a previous post that the arugula was bolting. 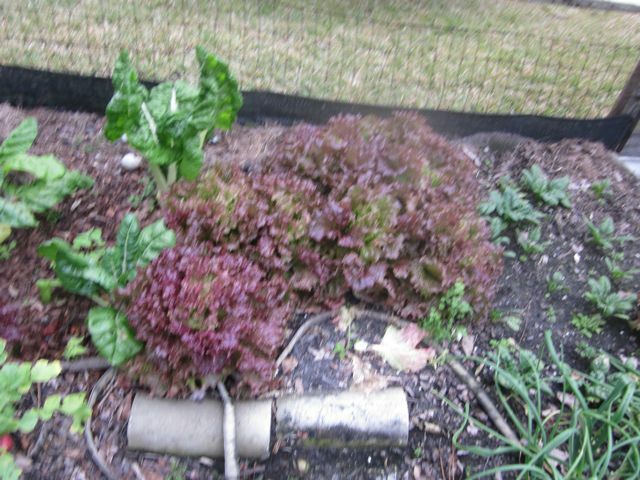 We still have plenty to mix with lettuce in salads but the bolted plants are being summarily yanked out to become compost. In bolting I think you can see the genetic lines back to the common dandelion – same flowering and cottony seed carriers. That shouldn’t be too surprising since I know both can be traced back to Italy. I found a new seed company, rather they found me and sent an unsolicited catalog. The place is Seedsnsuch. I have a couple of seed suppliers that I’ve dealt with for years so normally just discard these that come in over the transom. Something in the format or cover kept it out of the trash and into the quick glance pile. What I found was that they had a decent selection of seeds, packaged them in small packets and priced accordingly, and there was a reasonable shipping cost per order. With most of my regular suppliers shipping charges make it stupid to order just a couple of packets. I also liked that they are headquartered in South Carolina so more likely tuned into Southern plants. I bought a couple of packets that focused on “southern” growing conditions – that’s code for hot and humid.